It was a journey that began in Santiago de Cuba, and ended in Philadelphia, straddling nations long at odds and deep-seated divisions within society and politics. It involved meeting presidents, addressing congressmen and judges, and the largest ever gathering of nations at the U.N. 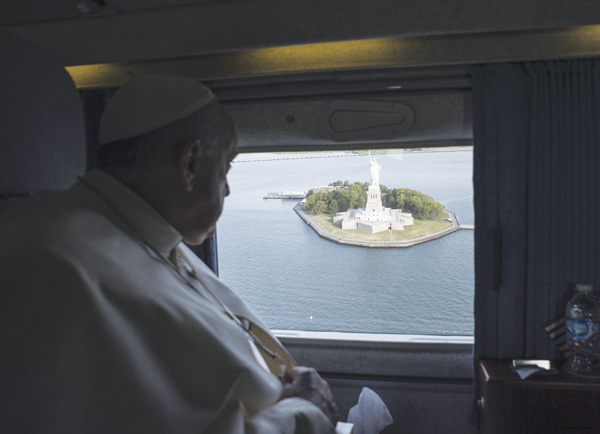 Yet among the most memorable moments of Pope Francis’s visit to the United States – some public, some private – were those with young people in Havana, school children in Harlem and prisoners in Philadelphia. If you were watching on television, you’ll perhaps be most struck by those close-up moments of the pope kissing babies and the disabled, or joking about mothers-in-law at the World Meeting of Families in Philadelphia. For U.S. Catholics, there will be many stand-out proud moments: the first ever canonization on American soil, of the great missionary Junípero Serra; the angelic music at the Mass in Madison Square Gardens, or the sublime Vespers in Cardinal Dolan’s newly refurbished St. Patrick’s Cathedral; not to mention the great final Mass on the Benjamin Franklin Parkway. These were great U.S. Church moments, when the Catholic community’s diversity, commitment, and resourcefulness were on display, along with the works in education and charity for which it is world-famous. Finding itself under a global spotlight, the U.S. Church rose wonderfully to the occasion. The one-in-every-three American Catholics who is now Hispanic had further reasons for joy. The first-ever pope from the New World arrived speaking mainly Spanish, “as an immigrant’s son,” he told President Obama. Referring to the refugee crisis in Europe and the steady stream of Mexicans and Central-Americans into the U.S., he warned against being taken back by the numbers and to remember their humanity. It was typical of Francis in both Cuba and the United States to begin by affirming the seeds of the Gospel in history and culture, pointing out to each nation their unique gifts and calling, and then inviting each country to be true to its better self. In Cuba, he suggested that the island had a vocation as the hinge, or key, of the hemisphere, “a point of encounter” that required openness and friendship. In the U.S., he spoke to Congress of the task of building a future in freedom that requires love of common good and cooperation in solidarity. In both cases, a greater respect for religious liberty was the crucial stepping-stone to each nation’s fulfillment, and was highlighted in his addresses to both presidents Castro and Obama. Francis also had strong words for the Church. He told bishops in Washington that he had come not to lecture or to judge, but to speak as a “brother among brothers.” Yet there were clear messages, in both this and other addresses throughout his visit, not to give into the temptations of worldliness. At St. Patrick’s Cathedral in Manhattan, he warned against measuring the work of the Church in terms of yardsticks of success and efficiency and urged clergy to spend their free time with the sick and the poor rather than in distraction. And in St. Charles Borromeo Seminary in Philadelphia, he urged bishops not to spend their time lamenting the decline of marriage and family but to focus energies on helping young people to embrace them. “A Christianity which ‘does’ little in practice, while incessantly ‘explaining’ its teachings, is dangerously unbalanced,” he noted. 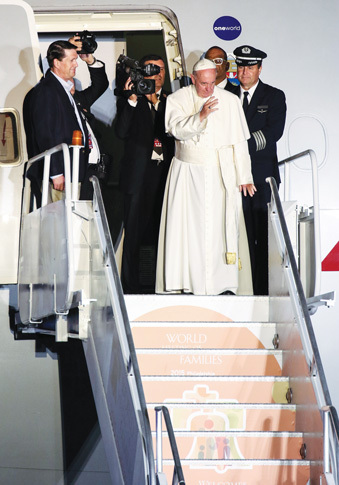 By all the usual yardsticks, Francis’s mission to America was a huge success. He deftly sidestepped the political polarities, inviting the U.S. to embrace a deeper vision; he gently but pointedly challenged the American Church to become more missionary, more periphery-focused, and less worldly and comfortable; and he received wall-to-wall coverage from a media that was fascinated by his warmth and his charisma, yet perplexed by his always being one step ahead of attempts to box him in. In a visit rich in photographed moments, it may be the pope’s tiny car that became the icon of this visit. Because security in all three cities was obsessive, the sight of the little Fiat hemmed in by fleets of flashing motorcades was both touching and symbolic of the pope amidst the power, opening new spaces for God to act in America.